Currywurst, a large-format fried or grilled sausage cut into thick slices and seasoned with spicy ketchup and generous amounts of curry powder, usually served with french fries — a popular snack originating in early 1950s Berlin. Both "Bockwurst"-style (i.e. intended to be boiled) and "Bratwurst"-style (i.e. intended to be grilled or fried) sausages are used depending on region and the use of one or the other is a matter for much debate among "Currywurst"-Gourmets. 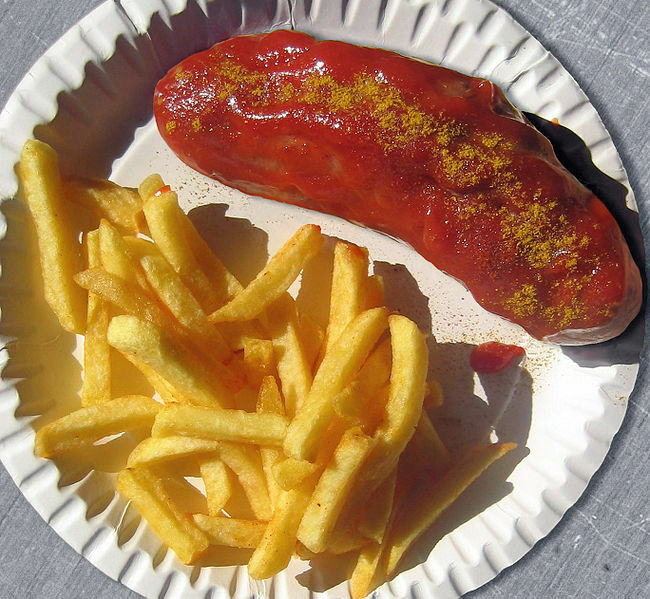 Currywurst remains one of most popular fast foods in Germany, especially in Berlin the Rhine-Ruhr area, but the Döner kebab is gaining rapidly in popularity.